Police are investigating a break in at a radiata pine field trial facility in Rotorua after hundreds of genetically-modified year-old trees were slashed and uprooted over Easter. The intruders were clever – they not only cut through perimeter fences but tunneled under a monitored security fence to get to the trees, which were planted about a year ago. Scion, the Crown research institute undertaking the trial, reckons the damage amounts to around $400,000. It will put back the research – which involves two trials testing herbicide resistance and methods of growing denser woods, but Scion has vowed to carry on the research. Nevertheless, the successful attack is a blow to the already depleted research into genetically modified organisms underway in New Zealand. Anti-GM activists have done a good job here in their attempts to eradicate this area of research using legal means and illegal “direct action” to target the organisations involved in GM research – and in some cases individual researchers themselves. Some scientists now fear that our ability to undertake GM research is so depleted due to the well-orchestrated attacks against it and the fear and doubt this has raised in the public consciousness, that we risk losing our edge in agricultural science. GM is a major area of research internationally, but one that NZ is apparently not allowed to be involved in. While we might think we can bury our heads in the sand and not be involved in GM research, this is unlikely to convince anyone outside of NZ. It will quite obviously further damage the morale of scientists, who as a professional group are demonstrably poorly paid and who suffer poor job security as well. This month [the People’s Moratorium Enforcement Agency] held a camp with the express purpose of “training activists in direct action techniques”. After Erma approval for a field trial of GM Roundup-resistant onions, 150 people descended on Mountain Valley School in Motueka, an independent institution running outside direct government control. People attending were a mix of punks and anarchists, older alternative lifestylers and urban students. There were workers from Greenpeace, GM campaigners from Christchurch, Auckland, Wellington and Tauranga, and a fair contingent of backpackers from Europe. Most were new to this sharp end of the movement, but there was a hard and vocal core of veterans. The Scion incident over the weekend has close parallels with what happened at Crop & Food Research back in 2002, where destruction of a potato trial resulted in the ruin of three years of research. in 1999 GM potatoes were again the target of activists, in this case the “Wild Greens” who broke into a facility at Lincoln. Security was boosted for GM trials in the wake of the 2002 breach, and Scion had upgraded its security in Rotorua. But anti-GM campaigners are noted for their attention to detail. It was spot checks from GE Free activists in 2009 that uncovered a GE brassica plant sprouting where it shouldn’t have been, effectively killing another piece of research. And activists regularly visit, monitor and photograph the perimeters of the few GM facilities left in New Zealand. Conner points out most other countries don’t have these kinds of controls imposed for field trials and the risks are overstated – especially in the case of onions which would not survive in the wild without human cultivation. He says 20 years experience with GM crops worldwide has shown very little evidence of environmental harm. Conner also believes it’s possible to overcome concerns from organic growers through coexistence management schemes that keep GM and organic crops separate. 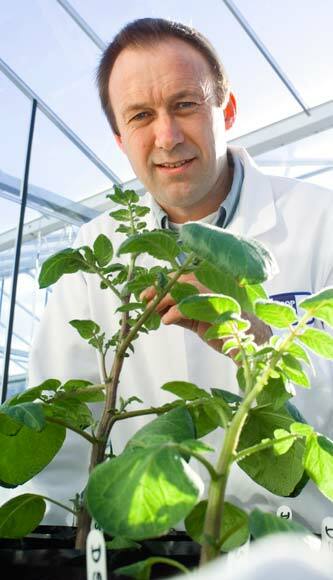 He hopes, too, that pest-resistant crops, allowing them to grow without the use of agricultural sprays, can be seen as a benefit to organic growers. As a former member of Greenpeace, he says that reducing pesticide sprays in the environment is what motivated him into GM research. Other scientists have also pointed out that incursions into field trial facilities may also do more harm than good for the anti-GM cause, increasing the risk of GM material being spread into the wild. These vandals probably thought the move away from the hand loom was a bad idea, too.